Trust is needed if you have lost your job, lost a contract, lost out on a good deal. Trust is needed if your circumstances are wobbled – if your home is under threat, if your income is very erratic, if several clients or customers cancel their contracts. When your foundations in life are shaky, or at least feel shaky, what can you do? The trouble is, most people don’t have that basic trust. In fact, what they have is a mistrust of life, leading to reacting to circumstances, rather than responding; to trying to control, or manipulate events and to interfere out of a desire to ‘make things happen’ It may not be huge, gut-wrenching fear – it might only be a low-level anxiety. But fear has a place in there somewhere if you look long and deep enough. So in order to cultivate trust, you have to start doing things differently. A client was talking about this very thing just the other day. “It’s like I’m hanging on to the trapeze and I just can’t let go.” She was considering whether or not to take on one contract and drop another. The trapeze is a great image because when you want to do something differently, it will require a leap. A leap of faith that the other trapeze will be there for you. And in order for that to happen, you have to jump at the precise time. With trapeze jumping, you only know it is the right time with relentless practice, over and over, of the same manoeuvre. Then you develop an instinct for the right time. You still have your safety net, and need to make sure the trapezes are in good order and working properly. But you also have the benefit of a ‘knowing’ when the right time is. With business, it’s unlikely you will be meeting the same challenges over and over, so your eye for the ‘right time’ gets honed due to experience in many different situations. Which means that you may very well feel scared when you are about to take a leap into an unknown situation. What you need then is the ability to trust, and it is this ability that gets honed when you practice trusting in the face of uncertainty. With my client, she became clear that there were other small steps that needed to be taken to make sure her ‘safety net’ was in order – ringing a colleague for specific advice, and doing the new contract for a month before letting go of the old one. Yes, she will still have to make that leap in the future, but when you have made sure that all your ‘equipment’ is safe, and that everything is in place, then you will be able to leap with trust that whatever happens when your hands touch that other trapeze, you will be OK.
Do you have a situation right now that is asking you to trust? If so, ask your heart if there are any little steps that need to be taken to help you feel your safety net is there, the trapeze is in good working order, and that you have prepared properly for that leap. You will still have to make that leap, even with great preparation, but leaping without it is just silly. You’ll still be all right, because there is always a safety net, whether you know it or not, but why not help yourself with taking those little steps first? There is a deep rhythm that moves through all life that cannot be controlled by our will. 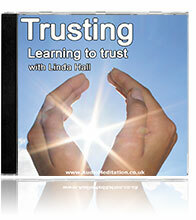 When trust informs our experience, it allows our psyche to relax and our soul to be at peace with our situation. We can rest in unquestioned confidence that the universe provides, that we have and will receive what we really need. In fact, often beyond what we alone are even capable of imagining. Aaah! Take a big breath as you read that. Really let it in. And if you feel that one of your steps might be getting some support to help you in your leap, then contact me and find out how I can help you.